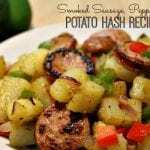 This Smoked Sausage, Pepper and Potato Hash Recipe is quick, easy and perfect for breakfast, lunch or dinner. One of my goals for 2015 is to keep a well stocked kitchen. Meaning, any given night I have ingredients in my pantry, refrigerator or freezer to put together around 20 different meals. I’ll go into more depth on this later, but seven days in and so far so good. We haven’t eaten out or had to make an emergency trip to the store because there was nothing to make for dinner. It’s such a great feeling and if I stay on top of things, it should lessen any dinner time stress. 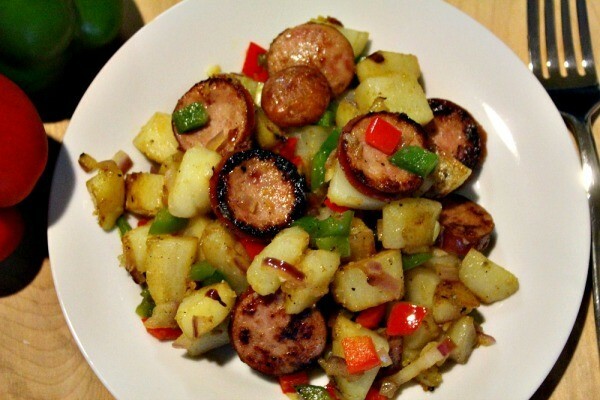 One thing everyone in my family loves is smoked sausage and potatoes together. Add in some garlic, peppers and red onions and oh my goodness, you have a winner. 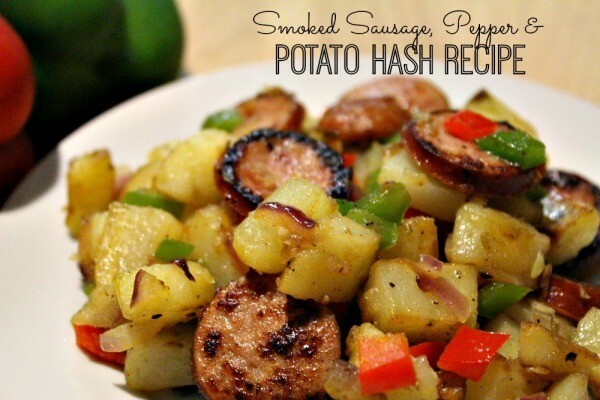 A potato hash recipe can be thrown together in minutes and there are so many variations. Just do some experimenting and come up with a recipe your family really likes. I use two skillets for this recipe. 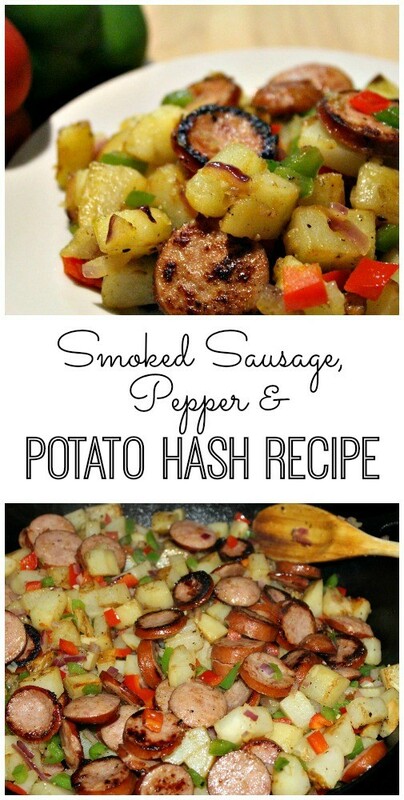 A cast iron skillet to cook up the potatoes and smoked sausage and another skillet to cook the red onion, garlic and peppers together. It just works well this way and although you could do this all in one skillet, I’ve noticed it cooks up better using two. Another one of my goals for 2015 is to be more efficient in the kitchen. Meaning, not wasting time and getting meals on the table faster. I’m still enjoying the process of cooking, just realizing that on most weeknights, I don’t have an hour to get dinner prepared. I’m a huge fan of Mark Bittman’s cookbooks and have had his book How to Cook Everything for quite some time. It has excellent, basic recipes using real food. I recently purchased his newest cookbook, which came out in October of 2014, titled How to Cook Everything Fast: A Better Way to Cook Great Food. If you are wanting to learn how to be a more efficient cook, I highly recommend this book. It also makes a great wedding gift or for a student moving out of their parents’ house and venturing out on their own for the first time. A fast, easy and comforting dish that's perfect for breakfast, lunch or dinner. 1. Heat 2 Tbsp. of the Olive Oil in a cast iron skillet over medium heat. Add the chopped potatoes and cook until done, about 7 to 10 minutes. 2. 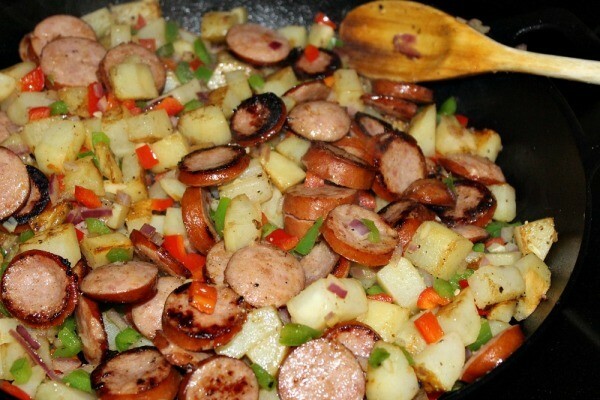 Push the potatoes to the side of the skillet and add the sliced sausage. Cook a few minutes, per side, until heated and browned. 3. While the sausage is cooking, heat the 1 Tbsp olive oil in another skillet and cook the peppers ,onion and garlic together. Cook until tender, but still a little crisp, about 5 to 7 minutes. 4. 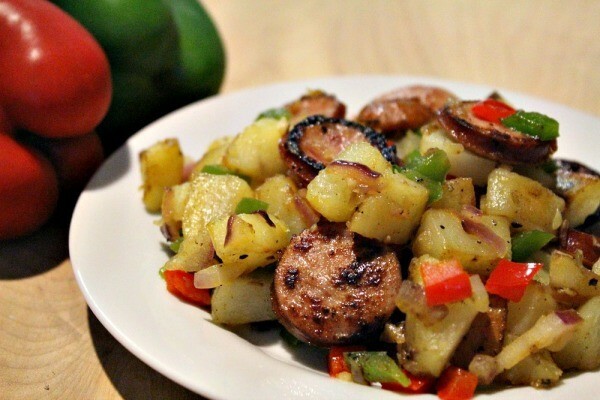 Season the potatoes and sausage with salt and pepper to taste. Stir around. 5. Add the peppers, onion and garlic to the skillet with the sausage and potatoes and stir to combine. Taste to see if it needs more seasoning. If you don't have a red onion, a yellow onion will work fine.